The Mofo Chronicles: Locked up..they won't let me out! Locked up..they won't let me out! OOOOOOH I'm so glad you asked. Now you know when you step into my world.. ONLY the most ignate ree ree ish happens to ME right? I had a doctor's appointment.. it went just like any other appointment.. they take you back and put you in an exam room and close the door. No problem right? Well, here's the first problem..and I blame myself for making a late appointment at 4pm and then scheduling a Soul Train interview at 6pm.. MY DAYUM FAULT. BUT I ASSumed that being one of the last patients of the day means I shouldn't be there very long right? So as 5:15 creeps upon us, I realize that I should probably tell these mofos that I have ish to do so either brang ya arse in here or I need to reschedule this ish.. I go to open the door. hmm.. maybe my hand is slippery because I can get a lil over excited when applying my beloved Forever Sunshine lotion from Bath and Body Works (that ish smells so f'n good but I digress).. so I wipe my hand on my shorts and try to turn the knob to open the door again..
nothing. panic starts to set in like I KNOW GOOD GOT DAYUM HELL WELL IN A HANDBASKET ON EASTER SUNDAY THAT I AM NOT LOCKED IN THIS MOFO! wooo sahhhhh wooooo wooo wooo woooo Breathe Mofo Breathe!!! I can hear them outside the door going UH OH...I think a patient is stuck in the exam room #4. I try to open the door again.. same ish.. nothing but a series of clicks. I hear them in the hallway still hollaring about some UH OH.. WTF YOU MEAN UH OH?! So I start knocking on the door screeching that I'm stuck..HELP! I got ish to do and I have to tinkle. They tell me help is on the way. So.. I hear Juan and Rico or whatever their names are..out there tinkering with the door..talm bout turn the knob. NOW MOFOS HOW CAN I TURN THE KNOB IF YOU ON THE OTHER SIDE HOLDING IT?! So the geniuses go get a screwdriver to remove the door knob. 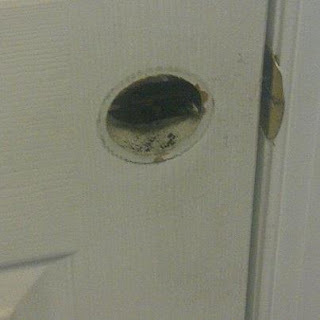 I swear I had a flashback to when I was probably 4 years old and I used to be grown as hell locking my bedroom door.. I can't tell you how many times my parents had to remove the door knob just to get me out.. and every mofo'n time I'd pee on myself. Luckily, I'm a for real grown up now and can control my bladder n ish. ANTYway, with that being said, I know darn hell well it don't take this long to remove a door knob and open the mofo'n door. Trust me.. my parents were experts at this until they finally got smart and took the f'n lock off my bedroom door but anyway..
10 minutes later, the door knob comes off..they ask me to grab it..I toss it across the room and one of them mofos puts his eyeball to the hole and says HI! I leaned forward and said "if you don't get me outta here you gonna think mofo'n hi!" So he shuts the munk up and asks me to grab the other end of the screwdriver and push. No I will not. I don't work here. I didn't get ME stuck in here, and I don't know WHOSE hands have been on that mofo. NO NO and NO. 15 minutes later.. they finally get the lock off the door and I'm free.. they are all standing in the hallway giggling. I AM NOT AMUSED. NOT ONE BIT. The Doctor says "I tried to get in there several times but couldn't then I went to get help".. Bish..no you didn't. Ya'll didn't even know I was stuck in here til I tried to get out. Then she says " You know, we've been having problems with that door"
So lemme get this straight. 1. THIS ENTIRE DOCTORS OFFICE KNEW THE DOOR WAS RAGGELY?! 2. YOU STILL PUT PATIENTS IN THAT EXAM ROOM AND CLOSE THE DOOR? 3. YOU ARE ADMITTING TO ME THAT YOU KNEW THIS ISH? Lawd help me right now and take this wheel, if you only knew how high my blood pressha is right now from this ish. So my question to my Mofo Chronicle Readers.. CAN I SUE THESE MOFOS for stressing me the f out and making me late for an interview?! LMAO!! I don't know but girl, these blogs are always too funny! Yet another good one!! IDK, but that's some funny ish...now. At the moment, I would have cussed everybody out! All I can say is "FLASH BACK"!!!!!! Still don't know why you continued to be grown and was always locking your bedroom door!!lol. And now this episode..Nobody but you my child! !